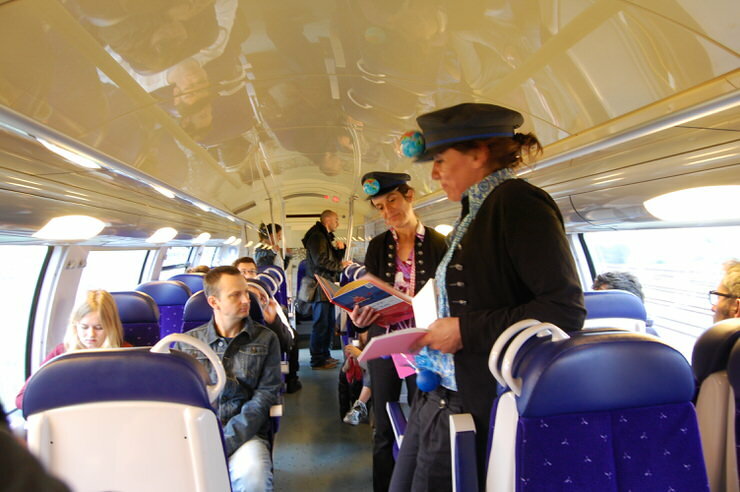 Our French partner, Région Pays de la Loire, has helped local residents to (re)discover their local station through the timeless appeal of storytelling. 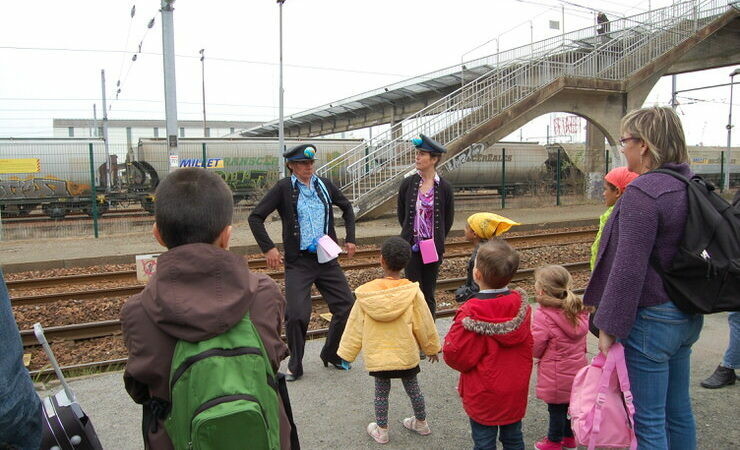 20 people – young and old – from Penhoët (the area around Saint-Nazaire’s docks) joined a pair of actors from local theatre troupe la Caravane Compagnie for a trip entitled “The Imaginary Journey”. 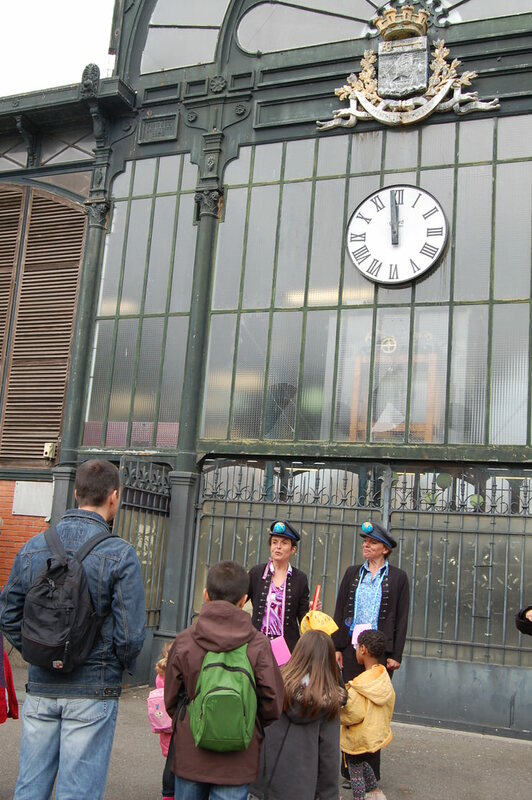 The experience began on foot, exploring iconic spots in the local neighbourhood, including the market hall shown below, and recounting tales of the shipyard workers, for whom Penhoët station was originally built. The next part of the journey was by train to Nantes. None of the children on the walk had ever taken a regional train before, and only two had ever been on a high speed train. Asked about their first impressions, the children’s answers were striking: “comfortable”, “quick”, “convenient” – all showing that the day had sparked a desire to explore the regional rail network more in future. 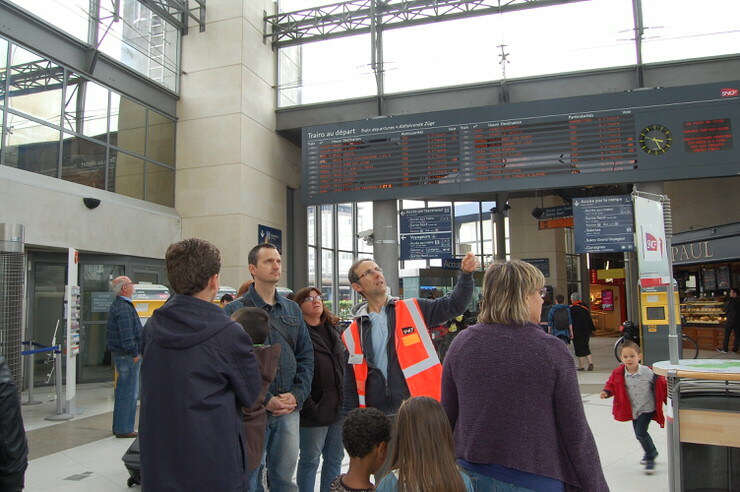 Upon arrival in Nantes, SNCF’s Marco Martinelli gave a tour of the station, answering the many questions from the families about the workings of the station and the logistics of travelling by train. 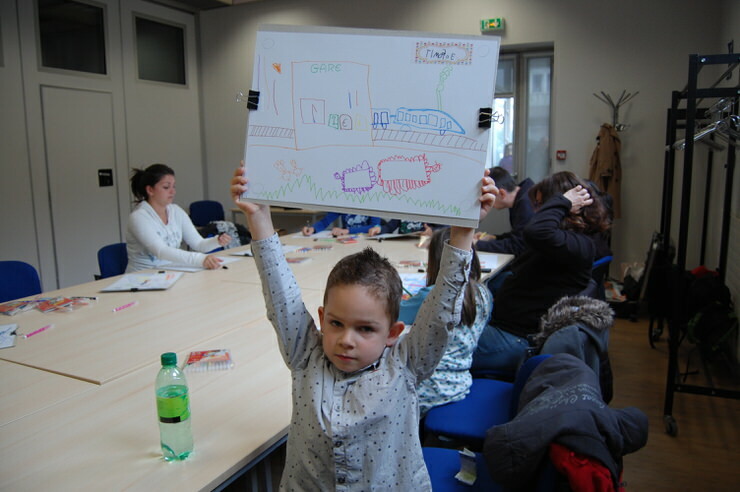 Children and parents were then invited to design their own “Imaginary Journey” in the comfort of a dedicated room provided by SNCF. After the real-life train journey earlier in the day, the imagination took hold – with some of the ideas generated including trains on the moon, and even trains that can cross oceans. The artwork produced will be put on public display this summer and throughout the improvement works scheduled at Penhoët station. 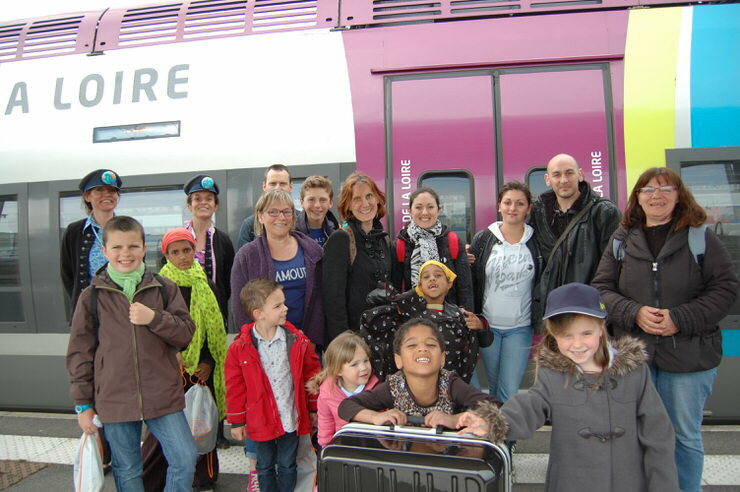 To say thank you, the Région and SNCF presented the children with a “passport”, giving them free travel on the Pays de la Loire network for two months. Inspired by a similar scheme by their fellow Citizens’ Rail partners Community Rail Lancashire, the passport is more than a souvenir of the day. It acts as an educational tool and makes commercial sense in terms of encouraging whole families to travel by rail more frequently. On the return journey, the actors told stories on the train using children’s books about dramatic railways around the world, from the Flying Scotsman to the Orient Express. 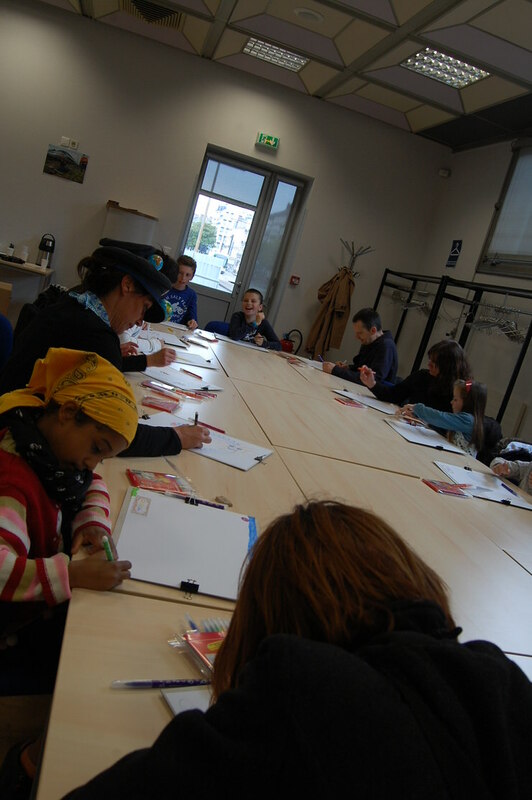 The project was organised in partnership with the events team of housing association la Maison de Quartier Méan-Penhoët. They emphasised that the key to making the event work was to have in depth discussions in advance, and to gradually build the content of the journey by working together. The project succeeded in its goal of linking the past and the future, by directly appealing to local residents and organisations, and by making full use of the regional network. The storytellers’ theatrical narrative meant that the event was immersed in the cultural identity of the Penhoët neighbourhood’s history and identity.